Home » Announcements » Pillows » Multiples » Two Peas In A Pod! The pillows measure 11 x 11 or bigger depending on the length of the names. 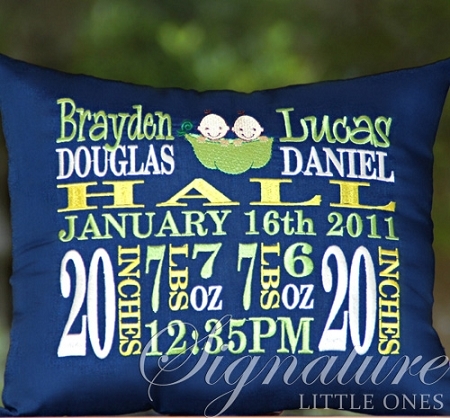 Each pillow can be personalized with baby name (up to 12 characters), date and time of birth, weight and length, and the first names of the proud parents, big sister or big brother; should you choose. You can omit any of this info if you wish, and we will design accordingly. You also have the option of matching a theme or room design, just add your information in the appropriate text area and/or email us a picture.